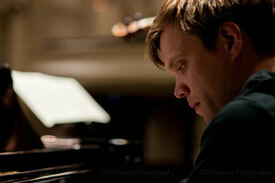 Edward Liddall is a young British pianist, in demand as a soloist, chamber musician and song accompanist. He has performed at venues and festivals across the UK and Europe both as a solo pianist, and as a chamber musician, including at The Barbican; The Wigmore Hall; The Concertgebouw, Amsterdam; and New Philharmonic Hall, Bratislava. He was a 2017 YCAT Finalist at The Wigmore Hall as a collaborative pianist, he won the accompaniment prize at the 2015 Maureen Lehane awards, and was a finalist in the 2015 Royal Overseas League Competition as a solo pianist. Recent highlights include a playing and acting role in Iain Burnside’s play Why Does The Queen Die? at the Oxford Lieder Festival and in London, a performance of Schubert’s Winterreise as part of Graham Johnson’s Song Guild, touring with Où donc est tombée ma jeunesse? in France and The Brighton Festival. Recent TV and radio broadcasts include appearances on BBC 4, BBC Radio 3 and Dutch National Radio. He has a keen interest in new music, and has recorded several works from the ABRSM volume, Spectrum for Piano Duet, with Thalia Myers. This summer, plans include The Aix-en-Provence Art of Recital Academy, with soprano Louise Kemény, under the tuition of Stéphane Degout and Alain Planès, as well as joining the piano faculty of the Keshet Eilon festival in Israel. From August 2018, he takes up a two-year residency at The Academy of the Opéra National in Paris, as pianist and vocal coach. Edward has had the opportunity to take part in masterclasses with artists such as Susan Tomes, Ferenc Rados, Ralf Gothoni, Graham Johnson, Malcolm Martineau, Ann Murray, Della Jones, and Andras Keller, and in 2016 he attended IMS Prussia Cove, where, together with 'cellist Leander Kippenberg, he took lessons with Thomas Ades. He has completed a Junior Fellowship at The Guildhall School of Music & Drama under the tutelage of Caroline Palmer, having previously completed a Masters degree (with distinction) there. Prior to this, he studied with Thalia Myers both at the Royal College of Music, Junior Department, and as an undergraduate at King’s College, Cambridge. He is grateful to The Worshipful Company of Tobacco Pipe Makers and The Worshipful Company of Cordwainers for supporting his studies at Guildhall; and to The Solti Foundation for providing a bursary to attend IMS Prussia Cove.